Mmmmmm, cinnnnnnammmmonnnn rolllllssss. 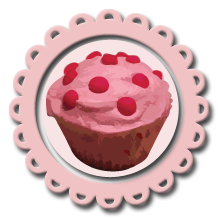 I have always loved cinnamon rolls… cinnamon, sugar, nuts and sweet dough rolled into pretty buns. I found this recipe in Deborah Madison’s “Vegetarian Cooking for Everyone.” This is the first time I have made cinnamon rolls from scratch. Even though I have thought about making them for a long time, I was hesistant to commit to the total preperation and baking time of 4 hours. Who wants to get up 4 hours before eating breakfast? I was going to prepare them and then refrigerate the dough overnight, but I got antsy and just had to cook them up for dessert (with leftovers for breakfast the next day). I have included instructions in the recipe for refrigerating the prepared dough overnight so you can have them fresh in the morning without having to wake up at the crack of dawn. Even though this recipe takes hours to be ready, most of that time is allowing the dough to rise. The actual work involved is pretty minimal. I made mine with the walnuts rolled up inside the dough, but I think it would be better with the nuts on top of the buns, so I have indicated that method in this recipe. 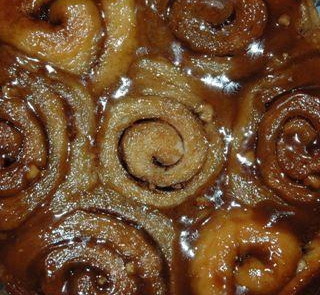 This recipe yeilds 14 sticky buns. Stir the milk, yeast, and one teaspoon of the sugar in a measuring cup and set aside until foamy, about 10 minutes. Beat the butter, sugar, and salt in a stand mixer with the paddle attachment until light and fluffy. Beat in the eggs, one at a time until well combined. Beat in the sour cream and yeast mixture until well combined. Stir in the flour, one cup at a time, just until the dough starts to come away from the side of the bowl. Turn the dough out onto a floured work surface and knead for a few minutes or until the dough feels smooth. Butter a large bowl and place the dough ball inside the bowl. Cover the bowl with plastic wrap and allow to rise in a warm place until double in bulk, about 2 hours. Mix the dry filling ingredients (raisins, brown sugar, and cinnamon) in a small bowl, set aside. Combine the sticky ingredients together (brown sugar, dark corn syrup, and butter) and pour evenly into 2 glass pie pans. Sprinkle the pecans over the sticky stuff. Once the dough has risen, push the dough down and roll into a 12 x16 inch rectangle. Brush the dough with the filling’s melted butter. Sprinkle the filling dry mixture evenly over the dough. Roll the dough up lengthwise. Slice the roll into rounds about 2 inches wide and set them in the prepared pie pans, cut side up. Place a large cookie sheet or aluminum foil underneath the pans in case the sticky drips while baking. Bake for 22-27 minutes or until the buns are lightly browned on top. Remove from oven and place pans on a cooling rack for 10 minutes. Invert the rolls onto a serving plate so the sticky is on top. Eat while warm or at room temperature. This entry was posted on Wednesday, January 21st, 2009 at 1:15 pm	and is filed under Breads. You can follow any responses to this entry through the RSS 2.0 feed. You can leave a response, or trackback from your own site.